On average, Americans spend five hours a day on the Internet. I would hanker a guess that people our age are spending a lot more time than that surfing the web and updating statuses, whether on a computer, smart phone or tablet. Often times, we refer to our constant Internet use as an addiction, but some psychologists are saying that it could actually be a clinical problem. Bradford Regional Medical Center believes that Internet addicts should seek treatment — at their new rehab facility. This Pennsylvania establishment is the first of its kind, specializing in Internet addiction therapies. In a Discovery News article from September 5, Kimberly Young, the chief psychologist at Bradford, treats Internet addiction as a physical and mental problem. 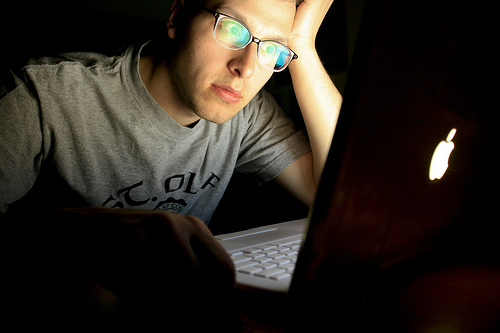 Young believes that Internet addiction could be worse than an alcohol addiction. After a ten-day detox, patients at Bradford can be cured of their constant screen staring and finger-typing. In an interview with CNN, Ryan Van Cleave, a former Internet addict, understands the struggles of overcoming an Internet addiction. This acclaimed writer, professor and husband lost his job, many friends and was close to getting a divorce as a result of his 80 hours per week of Internet dosage. Cleave said that a comparison to alcoholism is the only logical analogy. Many disagree with these claims, though. In the most recent update in the American Psychiatric Association’s DSM-5, it makes no mention of Internet addiction as an illness. John M. Grohol, psychologist and cofounder of Mental Health Net, argues that without a diagnosis there cannot be an in-patient treatment process. Young retaliates say that with more people on smart phones at all times, the Internet is even more accessible. Grohol said that the access to the Internet gives people a high that is similar to any other addition that can be treated with therapy and rehab. Since the Internet is around us at all times and is difficult to avoid, Van Cleave explains that the recovery process is more like that of someone with an eating disorder. With advancements in technology and a shift towards a fully digital medium, the Internet is still vital in order to gather information. Recovering is about learning which sites to get involved with and how long is too long online. So before traveling to Pennsylvania and admitting yourself into Bradford, try breaking from the Internet for a bit, so you don’t risk losing friends or a job. But first, send this article to your internet-obsessed friends, of course!